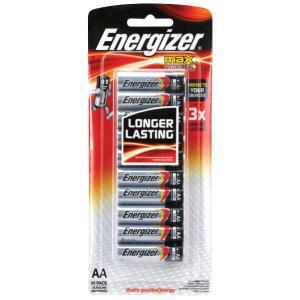 Ideal for powering remotes, doorbells and clocks, the Energizer Max® AA battery comes with a long shelf life of 10 years. It has an output voltage of 1.5V and features PowerSeal™ technology, which prevents the unwanted loss of energy, ensuring the battery lasts longer. Suitable for a wide range of electronic devices like remotes, clocks and more"